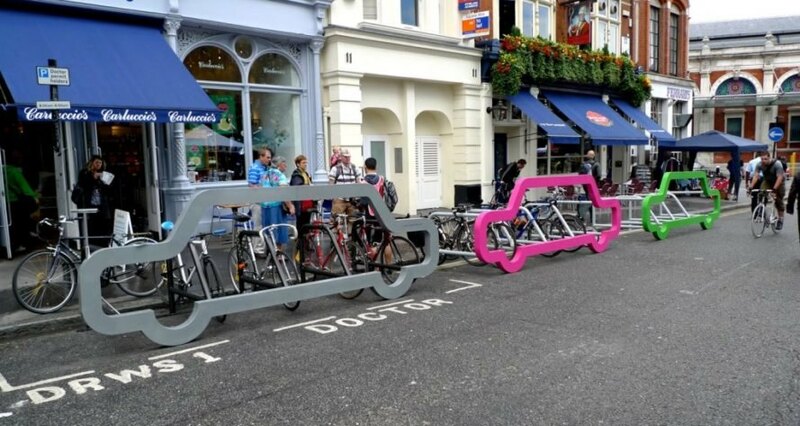 In an effort to encourage the use of bicycles over gas-guzzling vehicles, London’s Cyclehoop has created a clever car-shaped bike rack, which was commissioned for theLondon Festival of Architecture. Cyclehoop’s motto is that ten bicycles take up the space of one car, so each portable rack is designed to fit nicely in a regular car parking space. Not only does the design provide a safe place to lock a bike, but each rack also has an integrated bicycle pump as well! The brightly colored racks are similar to David Byrne’s art bike racks that are now all over New York. Each rack is easy to assemble, and they can be rented for events as well as purchased. 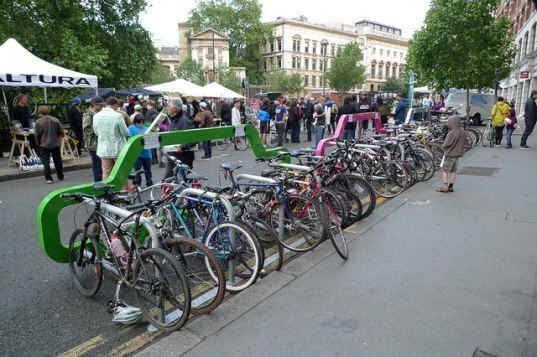 Cyclehoop installed three racks, in silver, pink and green, for the Festival of Architecture, and they were filled with parked bikes within minutes. The Car Rack is just one of many designs by Cyclehoop, which is a conglomerate of designers and architects dedicated to creating innovative indoor and outdoor bicycle parking solutions. Their bicycle hoop stand turns any street pole into a bike rack, which in turn can save city councils time and money. They also produce racks for railings, lamp posts, walls and cars. Cyclehoop’s new car-shaped bike racks bring awareness and recognition to the benefits of bike riding over driving — and they’re pretty darn cute too. Great idea and message! @norcanman - nice plug on your own products, I wouldnt put those on my street. Super share it is really. Friend on mine has been searching for this info. The inclusion of a bike pump is a nice touch. The use of a car-shape seems like it would create a safe method of re-use. Drivers are attuned to car shapes and to avoid them. Seeing a car-shaped bike rack would stop someone not paying attention from trying to park on-top of the bikes. Using Cyclepods, 16 bikes can be stored in one car park spot! !Better organization, less crowding.